Morean Arts Center | We’ve Been Nominated for a Good ‘Burger Award! We’ve Been Nominated for a Good ‘Burger Award! We’re happy to announce that the Morean Arts Center and the Chihuly Collection has been nominated for a 2018 Good ‘Burger Award from the St. Petersburg Chamber of Commerce. 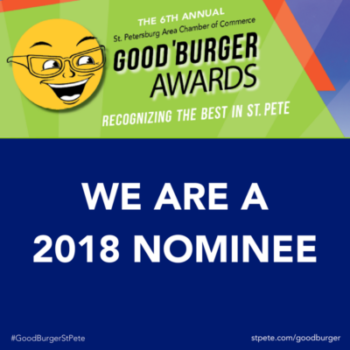 A Good ‘Burger is a business, organization, or individual in greater St. Pete making a positive impact in the community and we’ve been nominated in the Arts & Culture category! Cast your vote now until August 17.